Foundry has released Modo 12.2, the last of three linked updates to its modelling and animation tool forming the Modo 12 Series, following the release of Modo 12.0 in March and Modo 12.1 in June. 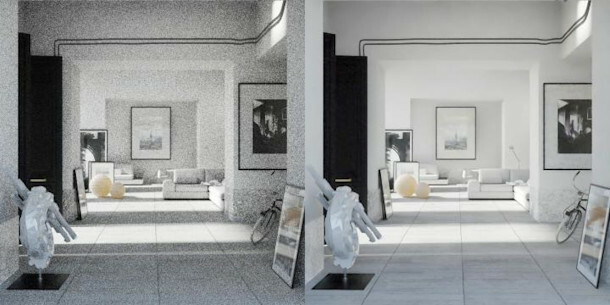 The update adds support for denoising of final-frame renders using Nvidia’s OptiX technology, and Workbenches, a new system for creating custom UI layouts. There are also ongoing updates to Modo’s modelling, UV editing and technical animation toolsets, the new integrated VR viewport, and the Modo Bridge to Unreal Engine. The update makes Modo the latest DCC application to integrate Nvidia’s GPU-accelerated OptiX render denoising system, also now used in Arnold, Clarisse, Houdini and V-Ray. It’s currently limited to final-quality output, rather than Modo’s progressive renderer; and to RGB passes, although Foundry says that it is looking at supporting occlusion passes in future. The other major new feature in Modo 12.2 is the Workbenches system for creating custom UI layouts. Intended as a more intutive alternative to using the Form Editor, the system enables uers to add “the majority” of button controls, item channels, commands and presets to custom interface panels. The system also supports macros, which should provide users of Modo Indie – which lacks support for scripting or third-party plugins – with more ways to extend the functionality of the software. The Indie edition is still on version 11.2, but in a livestream on Pixel Fondue’s YouTube channel, senior product manager Shane Griffith confirmed that Foundry is planning a 12.2 release. Other UI and workflow changes include the ability to add comments to items and have them displayed as tooltips, or filter items by comments; and improvements to Clip Choice and the Preset Browser. The OpenGL viewport also gets a new Bounding Box Threshold, forcing scenes above a specified polygon count to display as bounding boxes when panning or zooming the view, improving interactivity. Of the existing toolsets, there have been a number of improvements to UV mapping, including new procedural mesh operations for unwrapping, packing and scaling UVs, shown in the video above. There is also an operator for converting an existing UV map to a new mesh. As with other recent releases, all of Modo’s modelling toolsets have been updated, with changes to procedural modelling including a new Jitter operation for randomising the surface of a mesh. There is also a new procedural stitching system aimed at clothing and footwear designers: now one of Modo’s major user groups. MeshFusion, Modo’s real-time Boolean toolset, gets new controls for working with MeshFusion instances – historical snapshots of a MeshFusion system – and now generates better, quad-based topology at corners. Changes to the direct modelling toolset include depth snapping to help navigate complex scenes, and improvements to the way geometry and selections are displayed in the Advanced Viewport. The animation and rigging toolsets get another update – although, as with Modo 12.1, the changes stop short of the major overhaul that many character animators have been hoping for. Envelope presets, added in 12.1, have been extended to vector and scale as well as value and colour, and can now be saved as presets, making it possible to save and load custom animation curves. It is also now possible to filter the Channels list and Groups viewport; and there have been a number of workflow improvements to the Schematic viewport, including the option to adds comments. In the Pixel Fondue livestream, Shane Griffith described the changes as “foundational stuff”, and said that Foundry was working towards support for animation layers and true non-linear animation in future. The integrated VR viewport, added in Modo 12.1, gets new geometry selection options, including component selection; support for geometry layers; and a “small but refined” set of modelling tools. That includes the Pen tool for placing individual vertices, curve drawing, and slice, bevel, extrude, thicken and subdivide operations. The VR viewport also now supports Modo’s Topology Pen tool, which Foundry describes as helping to manipulate surfaces that would otherwise be difficult to edit with the limited set of other tools available. Modo Bridge, Modo’s live link to Unreal Engine, has also been updated: lights and cameras are now supported as well as geometry; and item transforms are produced “reliably”. According to Foundry, item transfers are “up to 400% faster” than in previous versions of Modo, and now happen in the background, making it possible to edit a scene while it is still being populated. One expected feature that hasn’t made it into Modo 12.2 is Radeon ProRender, AMD’s physically accurate GPU-based render engine, also now integrated into Cinema 4D. Shane Griffith commented that the implementation was “really, really close” to release, and that a tech preview compatible with Modo 12.2 should soon be available to users on subscriptions or maintenance. Modo 12.2 is available for 64-bit Windows 7+, RHEL and CentOS 7+ Linux, and Mac OS X 10.12+. New perpetual licences of the software cost $1,799, while rental starts at $599/year.